It's 2005. The Italian secret service has received intel that a group of Muslim immigrants based in Rome's Viale Marconi neighborhood is planning a terrorist attack. Christian Mazzari, a young Sicilian court translator who speaks perfect Arabic, goes undercover to infiltrate the group and learn who its leaders are. Christian poses as Issa, a recently arrived Tunisian in search of looking for a place to sleep and a job. He soon meets Sofia, a young Egyptian immigrant whose life with her husband, Said a.k.a. Felice, an architect who has reinvented himself as a pizza cook, is anything but fulfilling. In alternating voices, with an anthropologist's keen eye and sparkling wit Lakhous examines the commonplaces and stereotypes typical of life in multicultural societies. 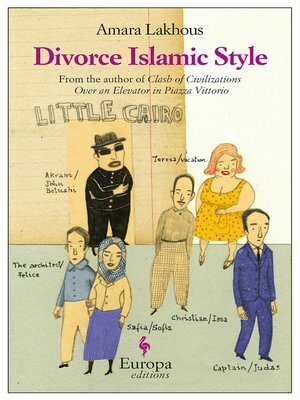 Divorce Islamic Style mixes the rational and the absurd as it describes the conflicts and contradictions of today's world. Marvelous set pieces, episodes rich in pathos, brilliant dialogue, and mordant folk proverbs combine as the novel moves towards an unforgettable and surprising finale that will have readers turning back to the first page of Lakhous's stunning novel to begin the ride all over again.